Ever thought to be a super hero for the city, now is your chance to be one in this fire truck rescue city firefighter hero 3D truck simulator. Start your day as a rescuer firefighter and truck driver, patrol the city and downtown alleys and eliminate the fire whenever you get emergency 911 call. Firefighters are real great heroes always ready to serve the city fire department in all circumstances. Play your role as an emergency 911 firefighter super rescue hero whose duty is to save people of the city stuck in the building under blazing fire, take your firefighting truck to the disaster site and make your way inside the wrecked building using huge ladder and help the survivors and injured people, as the city hero control the fire with your snorkel and use water hose eliminate the fire, combat your way into the wrecked structures of city buildings and houses on flames and strike the water hose. Call more rescue fire brigade to extinguish and disburse the blazing flames, use your siren and hooters to disperse the city traffic in the emergency duty drive to reach the location as soon as possible. In Fire Truck Rescue: City Firefighter simulator Hero 3D, rush drive and splash your fire rescue truck on the busy streets, wipeout the traffic with your siren and drive this 911 emergency fire rescue truck like a crazy highway road rider into the big city. Drive fast but don’t crash into the traffic accident. These American firefighters are real heroes for the city people in case of fire emergency, life of a superhero firefighter is full of dangers and adventures, always engaged in challenging duties and mission and always there when need as in accidents, clashes, blazing fires, floods and road spills. 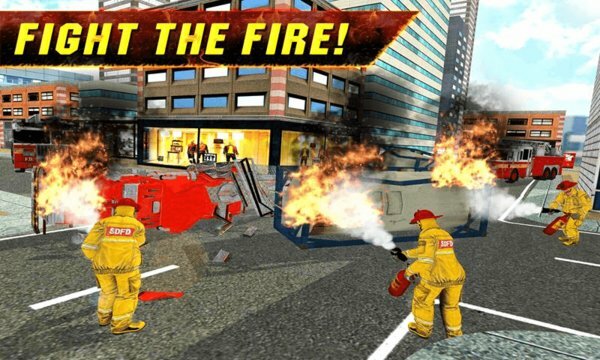 It’s all about call and duty in 911 emergency firetruck, be an efficient and ultimate rescue driver of the huge red firetruck and work in fire brigade station to save innocent citizens. Carry out the firefighter city rescue hero mission, put out fires on buildings, around busy car parking lots, hospitals, chemical factories, kids and children schools, city shopping malls and city builder sites fire disaster can happen anywhere, anytime. Get your firefighter uniform and firefighting equipment for the rescue, put your helmet and move out for the amazing wipeout adventure to extinguish the danger of disaster. Be an iconic super hero for the town and show act of bravery in emergency situations by driving your firefighting truck with furious speed and fast pace, grab your fire hose and speed up to save lives and show the real courage as the best duty driver of firetruck in 911 emergency firefighter city hero & rescue duty truck driver. You should know that in order to control the fire and stop the chain reaction that is causing the fire to spread, you must either bring the temperature down or cut the supply of oxygen to the fuel or you could also remove the source of combustion, which is the fuel, altogether from this space. 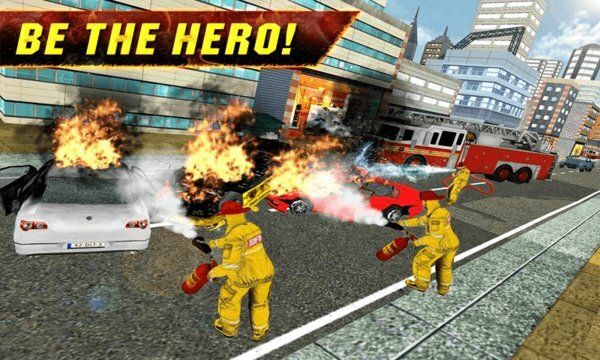 Help your firemen to launch the fire operation on the firemen trucks, lives of the innocent people are now in your hands, this is a real great chance to become an amazing American superhero firefighter, eliminate the burning and blazing infernos and save the iconic historic landmarks and city markets. As a brave firefighter you must stand with courage in your firefighter gear, fully equipped with protective gear, water hose pipe, emergency blue lights etc. You have to find the fire zone and extinguish the fire using water. • Firemen Gears Rescue Missions. • Realistic 3D City Environment & Game play.